Should You Send Flowers to a Funeral? Is It Appropriate to Send Flowers to a Funeral? If you've ever been to a funeral, you've probably noticed a variety of floral arrangements in different locations throughout the funeral home. Funeral flowers are meant to show respect, provide comfort, and offer cheer to those in mourning. Many people may hesitate to send flowers because they are unsure of the proper etiquette or understanding of what floral arrangements are acceptable. One thing to remember is that any flower can be appropriate. If you want assistance in choosing an arrangement, most florists are experienced with funerals and are happy to advise you. Should I send flowers to the funeral or memorial service? If so, what sort of arrangement is appropriate? If you want to send flowers, then by all means, yes, you should. You may have them delivered to the funeral home or to the home of the family of the deceased. However, if the family has requested a donation to a charity, you should honor that request. Most florists have funeral floral arrangements that you can choose from, but there is nothing wrong with sending a more personal arrangement of your choosing. You may send flowers on your own or get together with others for a larger, more elaborate arrangement. Coworkers, club members, or groups of close friends may choose to do this. If you're unable to attend the funeral, you may want to send flowers to let the family know you're thinking of them. They will appreciate your thoughts and sentiments during this difficult time. Funeral flowers vary according to region, custom, and personal preference. You may choose a nice arrangement in a bowl or vase, or you can select from a variety of funeral wreaths. Most florists will deliver to the funeral home so the flowers can be seen during the visitation. They will also deliver them to the gravesite for the funeral or afterward. For a casket - Choose a spray of larger, more dramatic flowers to drape over the casket. Casket sprays are often provided by the family members. Standing sprays - Large flowers that can be seen from across the room are appropriate for the stands in the funeral home. Arrangements for the family to take home - If you know the family member's favorite flower, it is always a nice gesture to select that as the focal point in an arrangement. Fill it in with complementary flowers to make it more attractive. Live flowers and plants - Another option is to choose live plants that a family member can take home to transplant in her garden. This will help keep the memory of her deceased loved one alive. 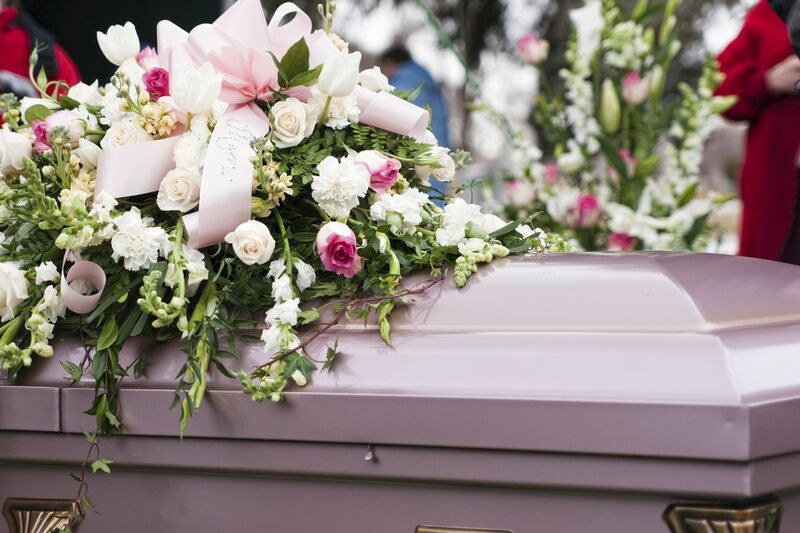 For a deceased child - A smaller arrangement is more appropriate for the funeral of a child. Choose something subtle and wispy so it doesn't overpower the casket. Pease accept our deepest sympathy. We are praying for your comfort in knowing how much [name of the deceased] was respected and loved. We will always remember [name of the deceased] for her generosity and kind spirit. You may send flowers to the family of the deceased at any time. If you are sending them to the funeral home, make sure they arrive the day of the funeral and as early as possible. You may want to contact the funeral home to find out their procedure for accepting flowers. It is never too early or too late to send flowers to the home of the family members. An early arrangement will provide something cheerful during this time of sadness. Whether or not you sent flowers to the funeral, you may want to send or deliver some flowers a few weeks or months later to show that you are thinking of the family that is still grieving. Some people may request a donation to a charity in lieu of flowers. Honor this and follow it up with a note to the family of the deceased, letting them know. They will appreciate the gift that may help someone else.